Garrett Ryan Chambers has dedicated his life to the service of others. Mr. Chambers realized his true calling at an early age by volunteering with afterschool programs and at his church. Mr. Chambers continued his service to others by volunteering throughout college, including leading a team of colleagues in the G.A.T.E. program (a program that educated immigrant families about the necessary steps to get their child into a four-year university) and volunteering his time at Inland Valley Partners (a food pantry that, through donations, provided food and other necessities to low income families). In College, Mr. Chambers combined his passion of serving others and his outgoing personality by working in the hospitality industry. Mr. Chambers provided unparalleled service as a waiter and bartender at several restaurants throughout his collegiate and law school tenure. Mr. Chambers boasted an impressive collegiate resume, graduating from University of La Verne with a Bachelor of Science degree in Business Administration, and also a captain on the Leopard football team. Mr. Chambers started two years as a Leopard and played the positions of offensive guard and center. Mr. 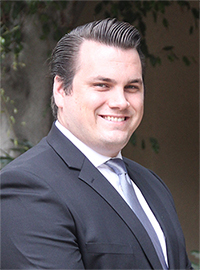 Chambers graduated from La Verne in 2011 and soon thereafter, had the privilege of sitting as a juror for a criminal case in the Orange County Superior Court. It was then and there that Mr. Chambers realized that his true purpose and ultimately, desired to become a trial attorney. Mr. Chambers started Law School at Western State College of Law, his father’s alma mater, in the spring of 2012. Throughout his tenure, Mr. Chambers immersed himself in the law and confirmed his passion of serving others by developing an aspiration for fighting for the rights of injured victims. Prior to graduating, Mr. Chambers was fortunate enough to travel overseas and study abroad in Madrid Spain through the prestigious and oldest U.S. Law School, William & Mary College of Law. Mr. Chambers was educated on foreign policy of the European Union, Comparative Corporations Law and advancing Internet law as it pertains to globalization. Additionally, Mr. Chambers was presented the opportunity to complete an item off his bucket list, running with the bulls in Pamplona, which he did with his father and brother. Mr. Chambers returned back to Western State to finish his law school career and graduated in the fall of 2014. Mr. Chambers took and passed the February 2015 California Bar Exam and soon thereafter, become a member of the California Bar. Mr. Chambers excelled in the MBE portion of the bar exam and scored within the top 5% in the nation. Currently, he is also licensed in North Dakota and Washington D.C. Mr. Chambers is also a graduate of the famous Gerry Spence Trial Lawyers College, which refined his trial skills and grew him as a person.